I have compiled a comperhensive trail guides list below in response to all the questions and comments I receive concerning the Olympic Mountains. This information should make your hike on the peninsula a great adventure! The world famous mountain ranges are located on the Olympic Peninsula. The wilderness interior is regulated by two federal agencies, the Olympic National Park and Olympic National Forest. Exploring such a colossal new area can be intimidating and sorting through all the information you may come across, overwhelming. I get a lot of questions from all types of visitors of various hiking levels, looking for different experiences for varying amounts of time. There are many more guide books than what I list below, but these are my personal top choices. In my experience there are four main types of visitors and below I have the best guide book for each. I find that having a physical book for trip planning from another state or country is vastly easier than trying to spend hours on google. Plus many parts of Olympic National Park will not have any cell phone reception or internet service whatsoever to reference while you're on the road. Having a physical guide can be a real lifesaver on the peninsula. Need more detail? Check out my Olympic Peninsula land management article. Disclaimer: Article contains ads in the form of affiliate links. 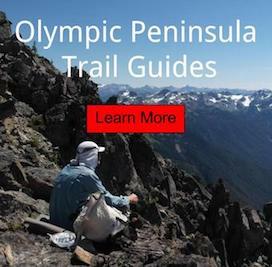 Day Hikers - Day Hiking Olympic Peninsula is my definitive choice for the best day hiking guide. It includes the whole peninsula. With not only Olympic National Park trails; but also Olympic National Forest, reservation and state lands. It is up to date with easy-to-understand descriptions, maps, ratings, elevation profiles, average drive times and nearby car camping options. Most included day hikes are less than 12 miles with options for extending your hike. What I love are the sidebars that make you feel like you have a personal guide with you, teaching you about flora/fauna/historical highlights. It is also a compact and convenient size that won't bog down your daypack. Most Backpackers - Hiking Olympic National Park is best for most backpackers of all abilities looking for a great adventure. Whether you're set on a strenuous backpacking trip over glacier-clad mountains or a short stroll along the coast or a temperate rain forest river. This updated edition now includes color photos, elevation profiles, GPS coordinates, directions to the trailhead and mile-by-mile directional cues. I found this gem from a ranger that used it as a reference to help hundreds of visitors plan their backpacking trips. It includes miles and miles of all the main trails and top backpacking trips with the most modern descriptions. Most importantly it leaves out all the information you don't need and includes all the necessary information to make you feel prepared and knowledgeable. Advanced Backpackers - Olympic Mountain Trail Guide is what I would recommend for advanced backpackers looking to possibly do some off trail. This guide has all the trails in the area and even includes abandoned trails. Keep in mind it has not been updated since 2000, so do more independent research and always call a ranger station to get current conditions. Nonetheless this book is a true classic that the most advanced Olympic National Park enthusiasts still refer to. If you're looking to really explore into parts that the average backpacker will not venture or are a repeat offender that's just looking to get to know the park on a deeper level this is the book for you! Mountaineers - Olympic Mountain Climbers Guide is a must own for mountaineers looking to take their adventures off trail. It contains route descriptions for all the named alpine traverses in the Park, as well as all summits if you're into mountaineering. Keep in mind that a lot of the route descriptions are very out of date, so do not trust this guide with your life. Rock climbing is notoriously dulled down, from what it truly is out there; be careful. Olympic rock can be very 'rotten'. National Geographic Trails Illustrated Map - Olympic National Park Map is a great tool for planning. It has all the maintained trails in the Park, as well as the Pacific Northwest Trail; that also goes through the Peninsula. This map does not have enough topographical detail to safely use on overnight backpacking adventures (although it does include all the backcountry wilderness sites). I suggest purchasing better maps to use on your backpacking adventure but this is an excellent map for the whole park with all the trails, campsites, main roads, sights and visitor centers. Having one large overarching map of the whole park is a great addition to trip planning and is fun souvenir to take home and pin up on the wall when you get home. One fun thing to do on your trip is collect stamps on your map at all the different ranger stations. Want free? Get detailed Olympic National Forest and Park Maps here!